Firefighters contained a fire to one structure at an apartment construction site Tuesday in Anaheim after part of the buidling's roof collapsed. The fire was reported at about 8:30 a.m. in the 100 block of North Muller Street. 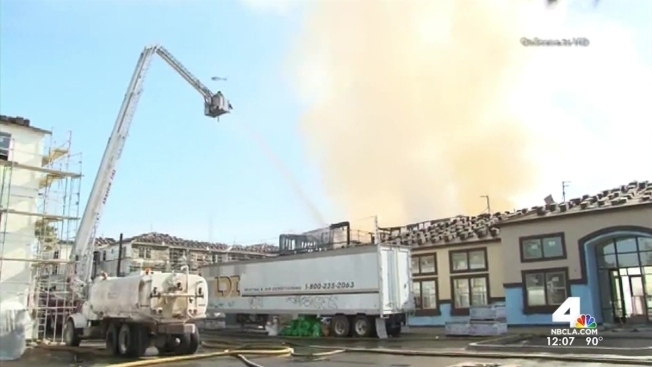 Aerial video showed a heavily damaged two-story building that partially collapsed in the fire. The building was one of about 10 under construction at the site (map), located southwest of the 5 Freeway. Smoke could be seen as far away as the San Fernando Valley. No injuries were reported. Details regarding the cause of the fire were not immediately available, but authorities said a worker was soldering at the time the fire started.